The visual appearance and impact within the indoor environment are primarily determined by the architecture. LTG SystemDesign makes it possible to implement various air-conditioning solutions in different building areas based on a uniform visual pattern. 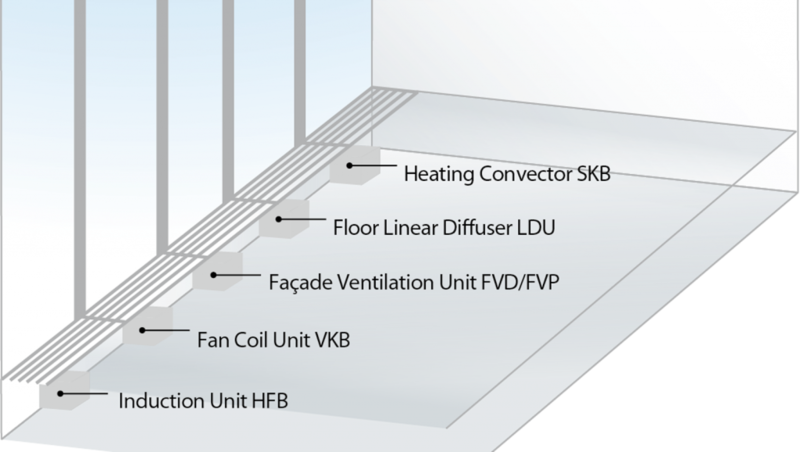 In many cases, varying conditions and comfort-related requirements demand the use of different ventilation and air-conditioning systems in one and the same building. Previously, the different systems also looked different. LTG’s SystemDesign for floor-mounted units solves this problem. Different units for different air- conditioning systems can be concealed behind exactly the same ventilation grille and give the rooms where they are installed a harmonious visual appearance – bringing many advantages for investors, architects, planners and process engineers alike. For architects, they are the answer to a long-standing need: the grilles can be mounted as a continuous strip and – being available from a width of 200 mm – are comparatively narrow. They are available in a range of materials and colours. The discharge grilles are positioned directly at the facade. The floor cutouts for all the units integrated in the LTG SystemDesign are identical. For planners, this simplifies the planning of the building, while investors save on the cost of construction work. All the units of LTG SystemDesign have the same structure. While process engineers appreciate the simplified assembly and maintenance this brings, investors again benefit from reduced costs. A major advantage for investors and landlords is the ease with which the air-conditioning and ventilation technology can be adapted, for example when a room is used for a different purpose. And this remains true in the event of a retrofit or conversion. Products that use LTG SystemDesign: HFB, VKB, SKB, FVD and FVPpulse.